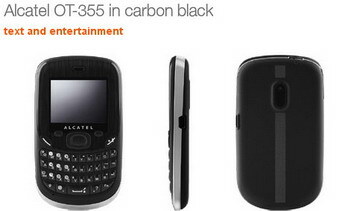 Orange UK has a new entry-level QWERTY device in its portfolio - it's the Alcatel OT-355. The messaging phone comes with QWERTY keypad, VGA camera, MP3 player, FM radio with RDS, up to 4GB MicroSD card support. Unfortunately, It has no 3G connectivity. The battery is able to provide a talk-time of up to 9 hours, or a standby time of up to 7 days. The Alcatel OT-355 will be available to Pay As You Go customers via Orange UK. No word on price but it probably costs under £50. 0 comments on "Alcatel OT-355 QWERTY phone for Orange UK"